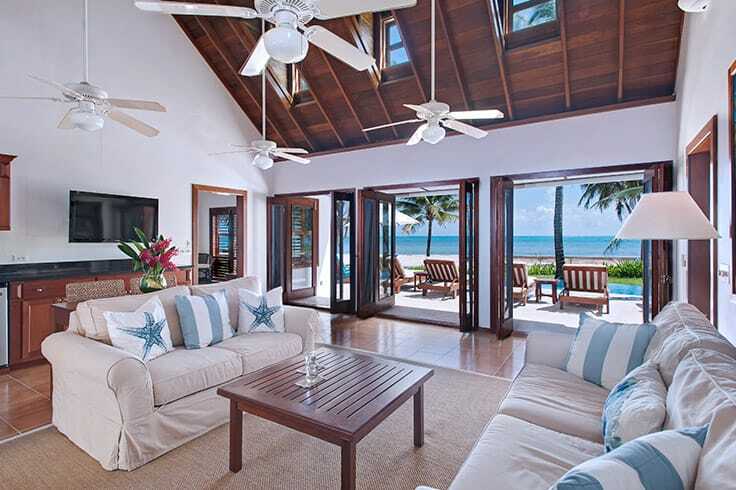 Imagine waking up to a view of the sparkling Caribbean Sea, with patches of aqua and turquoise and a deep azure shimmering just beyond the pristine white sand beach. You realize you’ve found your perfect paradise at a tropical oasis called Victoria House Resort & Spa. Grab a cup of rich local coffee and gently swing in your private veranda hammock while you listen to the breeze rustle the palm trees all around. A yellow-backed oriole is chirping melodiously while perched in a sprawling bougainvillea bush nearby. You might even spot a cautious green iguana as it scouts for a morning snack. This isn’t just any beach vacation – you are in one of the world’s top-rated resorts in a tropical paradise unlike any other. 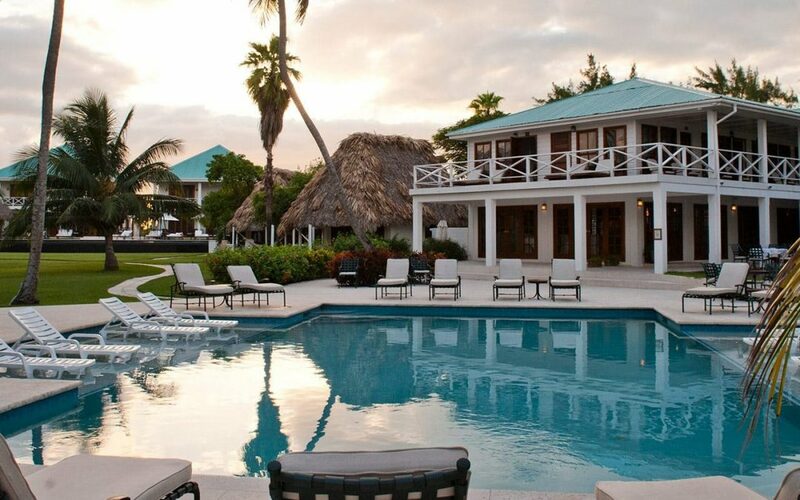 Victoria House Resort & Spa, founded as a resort in 1981, sits at the southern end of Ambergris Caye, Belize. Every room faces the ocean and every day is a new adventure. You can choose to explore or relax – whatever you are in the mood for! Belize, formerly known as British Honduras, is a quaint country on the eastern coast of Central America, just south of the Yucatan Peninsula of Mexico. Located about 35 miles off the mainland, Ambergris Caye is the largest of many cayes that dot the coastline. This gorgeous island is easily accessible by water taxi or plane. It is 25 miles in length and only about one mile wide, with pristine white beaches lining most of the island. A visit to the Caribbean is not complete without a trip to Ambergris Caye, especially if you stay at Victoria House Resort & Spa, one of the most celebrated resorts in all of Belize. Victoria House Resort & Spa is a luxury resort that offers accommodations for nearly every budget. Choices range from the more affordable staterooms to spacious suites and stunning beach-front villas that will accommodate a large group of friends of family members. The latest addition is the world-class Infinity section of the resort. Here you’ll find luxury villas and suites and a tranquil infinity edge pool to relax in after a day of exploring. 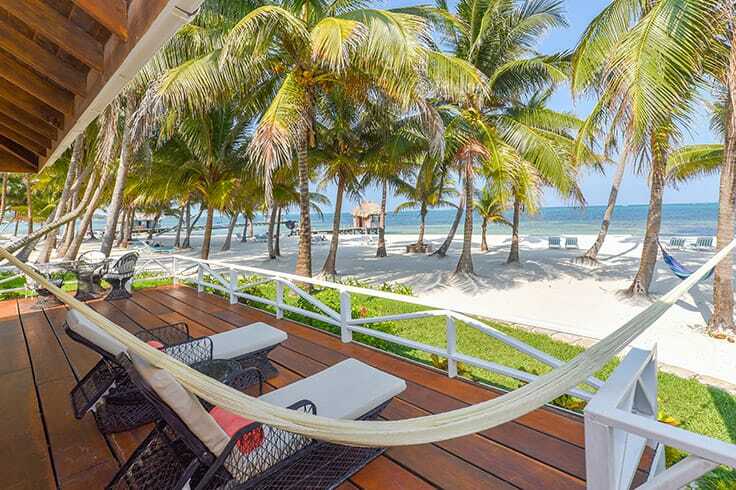 For a quintessential tropical experience complete with thatched roof, plush queen bed, private veranda and your own hammock, choose to stay in one of the popular beachfront casitas. Each of the 42 rooms boasts bamboo and mahogany furniture, luxurious tile bathrooms, comfy chaise lounges and complimentary ocean breezes. With five unique accommodation options, you can pick the space that best fits your budget and party size. No tropical vacation is complete without a little pampering. Luckily, the spa at Victoria House is open seven days a week and features over 36 different treatments – including ones specifically designed for bridal parties and couples. At 3,500 sq. ft., this world-class facility is the largest of its kind on Ambergris Caye. Set amongst soaring coconut palms and vibrant flamboyant trees, the new spa building is styled in a Caribbean colonial theme with towering ceilings and expansive windows that invite in natural light. There are four treatment rooms (including one just for couples), three of which open directly onto an enclosed courtyard with cushioned chairs and individual curtained showers. In addition to the outdoor showers, the spa has separate locker rooms for men and women and a relaxation room offering snacks and tea. If you’re not ready to give your exercise routine a break, don’t worry. The spa includes a fully-equipped fitness center for the workout of your choice. If it’s yoga you prefer, classes are offered three times a week right on the beach! How would you like to take your spa treatment to a whole new level? Imagine enjoying a relaxing massage in an open-air gazebo perched just inches above the gentle waves of the ocean. The rhythmic sounds of the water lapping below you coupled with the skilled hands of your therapist will knead you into a blissful state of semi-consciousness. Start your day with a Complimentary continental breakfast buffet, which is included in the room rate. When you start to get hungry later in the day, head on down to Admiral Nelson’s Beach Bar for a snack or a meal with a view. This oceanfront oasis boasts fresh fish tacos and coconut shrimp, served up with an ice-cold beer or a refreshing signature ginger limeade cocktail. Guests love to hang out and play one of the board games or just reminisce on the activities of the day. 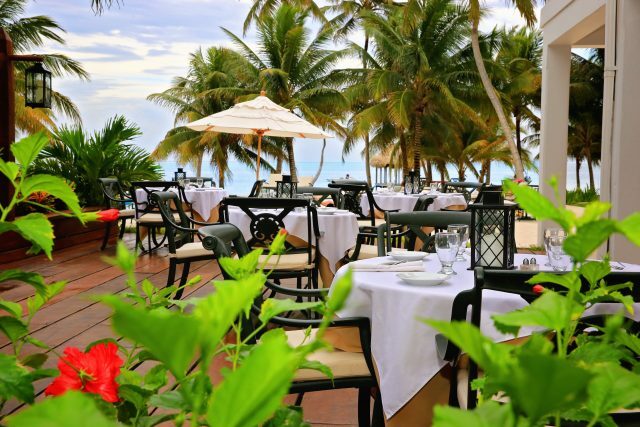 For full-service dining at any time of day, treat your taste buds to the Palmilla Restaurant. You can choose the comfort of the air-conditioned dining room or enjoy the ambiance (and breezes) of the outdoor veranda. The chef’s delight in preparing everything to order and specialize in creative dishes with a local flair. Some of the specialties include homemade breads, conch ceviche, grilled lobster and cashew crusted catch of the day. Top it all off with the perfect crème brûlée or after-dinner cocktail. Did you return from the day’s fishing expedition with a cooler full of snapper? The chefs at Palmilla will be happy to prepare it to order for you. And if you don’t want to miss an opportunity to get some sun, order from The Poolside Patio menu and indulge without ever needing to leave your lounge chair. Are you in heaven yet? Obviously, with all these luxurious delights, Victoria House Resort & Spa offers a variety of special packages for your big event. Whether you dream of getting married (or renewing your vows) in one of the most gorgeous places on earth or enjoying a long-awaited family reunion, Victoria House will make sure your only job is to show up and enjoy your celebration. From the planning to the catering, everything is handled by their expert staff. Imagine saying “I do” as the sunset turns the sky a brilliant pink and your toes curl into the cooling sand. No wonder Victoria House was awarded the 2018 Conde Nast Johansen’s award for being the best resort for weddings, parties, and special celebrations! For those seeking adventure, you can’t go wrong in Belize. The Victoria House will help you get to all the out-of-the-way places you might want to explore on (and off) this magical isle. After all, the Belize Barrier Reef (the world’s 2nd largest) lies just off the shores of Ambergris Caye. After a brief but exhilarating boat ride from the Victoria House Pier, you’ll be snorkeling or scuba diving in beautiful local spots, including Hol Chan Marine Reserve and Shark Ray Alley, where you can marvel at a colorful variety of coral or swim with peaceful nurse sharks and graceful stingrays. If you’d like to try scuba diving, Victoria House offers certification classes with qualified instructors. Seasoned divers can head out to the Great Blue Hole, a true natural wonder and UNESCO World Heritage Site. This famous sinkhole is over 400 feet deep and 900 feet across and can even be seen from space! Not a diver? Arrange for a helicopter tour for a true birds-eye view! For those interested in history, Victoria House will be happy to arrange transportation to the mainland, where you can explore the largest collection of ancient Mayan Ruins nestled deep in the jungles and rainforests. Whichever adventure you choose, the photos you capture will delight you and your friends for years to come. When you’re ready to book your dream vacation, Victoria House Resort & Spa is ready to make your tropical paradise dreams come true. 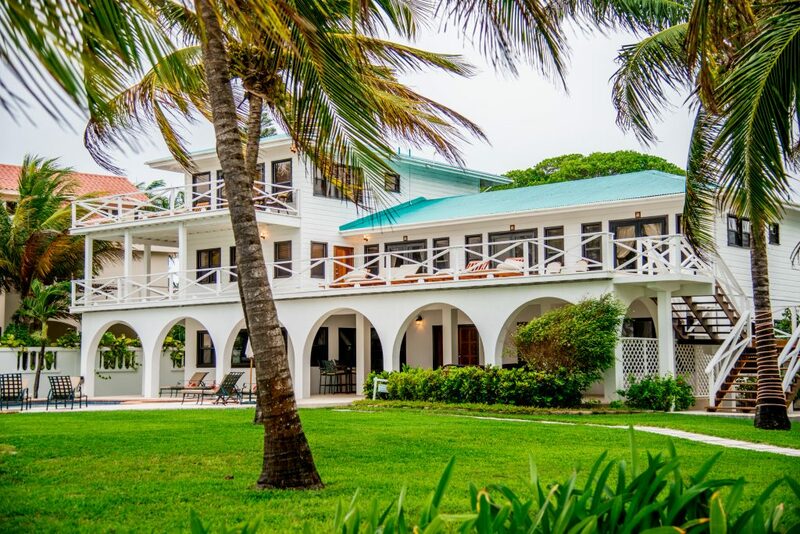 Located at 22 Coconut Drive, San Pedro, Ambergris Caye, Belize. For reservations, call 1-800-247-5159. Disclosure of Material Connection: This is a “sponsored post.” The companies mentioned in this post have compensated me via accommodations, meals or activities. However, I only recommend companies I have personally experienced and believe will be enjoyable for my readers. All reviews and opinions expressed are based on my personal view.